Outdoor enthusiasts may have put away their hiking boots, bikes, and canoes for the season, but hibernation is not an option – winter is a great time to explore the outdoors. And downhill skiing isn’t the only snow sport in town. Both snowshoeing and cross-country skiing are far more affordable and accessible than their downhill cousin, perfect for a half-day or multi-day excursion in the mountains. Which is right for you? 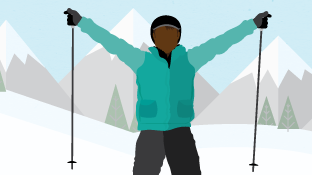 Snowshoeing vs. Cross-country Skiing: Which Is Best? In the showdown between snowshoeing and cross-country skiing, there’s no right or wrong answer – only the method of snow play that’s best for you. Snowshoeing: Think of snowshoeing season as an extended hiking season. Almost any high altitude hiking trail can become a snowshoeing trail in winter, making the options for enjoying the sport nearly endless. Snowshoes are easy to store and pack in the car, and can strap onto backpacks for quick access. Once the initial purchase of gear is made, snowshoeing is often free, since enthusiasts can snowshoe in most public lands and on most backcountry trails. When it comes to selecting a model, keep in mind that most major snowshoe brands will offer an advanced backcountry exploration model and a touring or recreational model. The latter works for almost all beginners. Cross-country skiing: While cross-country skiing takes a bit more time to learn than snowshoeing, it’s far easier to accomplish than downhill skiing, while still providing some thrills. This makes it a great sport for families with young children to try. Like snowshoeing, cross-country skiing is an affordable sport; passes to access Nordic trails at most major ski resorts are less than half the cost of a downhill lift ticket. When deciding what type of skis to buy, consider this: the vast majority of new cross-country skiers will want fish scale bases. These etched ridges on the underside of the ski provide just enough grip while still allowing the ski to glide. The alternative, skins, are usually removable for backcountry skis, but built-in for some cross-country skis. These small patches give strong grip and stability, but less glide. Be prepared for a workout! The good news: both snowshoeing and cross-country skiing provide great workouts for maximum health benefits, provided you’re using proper form. Here’s how to hike or glide for a full body workout. Cross-country skiing technique: Cross-country skiing is slightly more technical than snowshoeing, but still possible to learn in only a few outings. Instead of pointing skis downward and turning, as downhill skiers do, cross-country skiing is all about the glide motion. Bend your knees slightly and kick one foot forward, then pull the other ahead to meet it. As your weight transfers, you’ll glide. Tip: move your arms as you go. They should be aiding your glide motion, not staying flat at your sides. 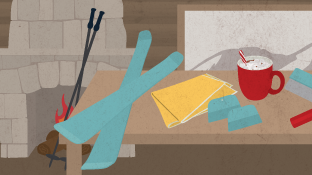 To brake on downhill sections, turn your toes inward to create a “pizza wedge” with your skis. Wool base layer and socks: choose a dedicated snow sport sock to ensure it will wick away moisture and cover your calf for best protection. Wool tights and a long-sleeved base layer shirt protect you from wind chill while still allowing your body to breathe. Waterproof outer layers: choose a ski pant designed for backcountry skiing or snowshoeing. It will have more flexibility in the joints than a standard downhill ski pant, be lighter and thinner, yet still remain waterproof. Select a jacket that can be used as a shell, with a sweater or mid-layer underneath. This allows you to shed layers as you work out. Hat and gloves: Gloves should be waterproof. Consider a glove with a liner, so the outer gloves can be taken off if you heat up during your workout. Gaiters: Consider investing in gaiters to cover your ankles and calves. They provide more protection from snow exposure than ski pants alone. They are especially useful in heavy powder. Boots: Snowshoe enthusiasts have the flexibility of selecting a boot from a wider variety of sources: any well-made, waterproof snow boot will work, provided it has enough traction and covers the ankle. Skiers will want to find a cross-country boot that fits their ski binding, so it’s best to purchase skis and boots simultaneously. Cross-country ski boots are thinner and lighter than snow boots, a plus for comfort. Snowshoe technique: If you can walk or hike, you can snowshoe. It really is that easy. The difference is that snowshoeing requires a wider stance and a need to lift and place a wider surface area than your foot (that is, your snowshoe instead of your sneaker). Therefore, new snowshoers will definitely feel some previously underworked muscles. To ease this transition, hike with wider steps and toes pointing slightly outward when ascending hills, and keep knees bent when descending. Tip: carry ski poles for better balance. Snow parks: Most counties in snowy areas have public snow parks where winter sport enthusiasts gather. Expect to see motorized snow sports as well, with some dedicated ski trails. Many trails at snow parks and Nordic centers (described below) rate ski and snowshoe trails by the downhill ski system: green means beginner, blue means intermediate, and black means advanced. Expect advanced trails to include steep grades and tight turns. Nordic centers at ski resorts: With ready-made, often groomed Nordic trails, cushy warming huts, and services such as rentals and a pro shop, Nordic centers at ski resorts can be among the easiest and most enjoyable of ski and snowshoe destinations. Be sure to ask ahead of time where snowshoes are permitted, and expect to pay a small daily pass fee. Meadows or pastures: Flat, open spaces like meadows and pastures are great places to learn to snowshoe or ski, and can often be found locally. Remember to get permission if the pasture is private land. Hut-to-hut systems: For the advanced skier or snowshoer, hut-to-hut organizations offer trail systems that connect backcountry huts or cabins where skiers can spend overnights. Most come with food and water provided in the huts, freeing you up to carry only personal essentials on your back. No matter where you enjoy the outdoors, and whether you ski or snowshoe, you’ll enjoy another full season of outdoor recreation once you try a winter snow sport! 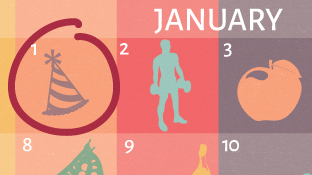 Don’t Quit Now – Keep Your Health Resolutions All Year Long!